Sign in to OneDrive and open the file you want to post. 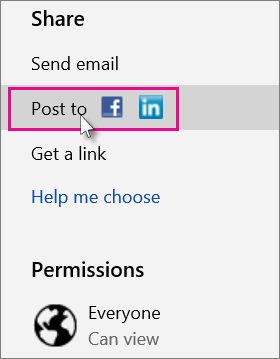 Under Share, click Post to, click add services, and then pick a social network to connect to. 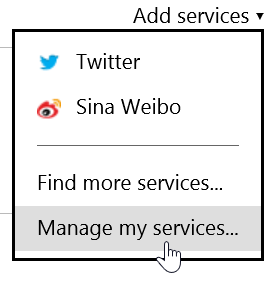 Note: If you don’t see the social network you want in the list, click Find more services and follow the online instructions to add it. Allow your OneDrive and social network accounts to connect with one another. Note: Each social network requires that you authorize the connection. To change the connection permissions at any time, see Change or remove a connection to a social network below. Under Share, click Post to. 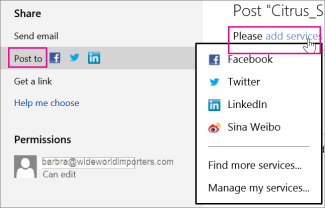 Check one or more boxes for the social network(s) you want to post your presentation to. Type a message about the presentation you’re posting. 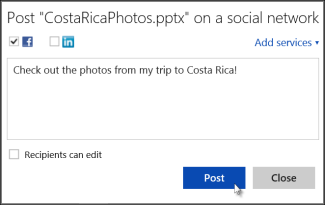 Allow people (who sign in to OneDrive) to edit your posted presentation by checking Recipients can edit. 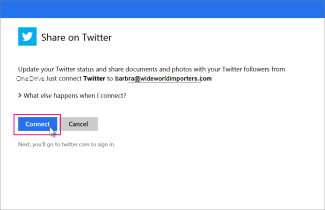 If you have set up a connection between OneDrive and a social network such as Facebook, Twitter, LinkedIn, or others, you can remove that connection at any time. 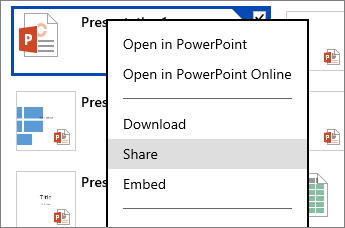 Sign in to OneDrive, right-click the presentation file, and then click Sharing. Click Add services, and then click Manage my services. Click Edit below the social network you want to change, for example Facebook. Click Remove this connection completely, and then click Remove.